Western Paper offers both onsite and in house repair on nearly all makes and models of cleaning equipment, including such industry leading brands as Taski, Tennant/Nobles, Windsor and Proteam. In addition, we stock more than 600 service parts to expedite repairs and reduce equipment downtime. We offer pickup and delivery service on a wide variety of equipment, such as auto scrubbers, (walk behind and riders), high-speed burnishers, buffers, carpet extractors, wet/dry vacs, vacuums (upright, backpack, sweepers)—everything from a walk behind to a rider and both corded and battery powered. We can even show you how to get the most of your machines and provide periodic reporting on their usage patterns and proactive needs. To extend the life of your machines and ensure they are performing to the best of their abilities, a routine of scheduled maintenance is vital. Western Paper is your trusted partner for ongoing maintenance. We offer flexible billing options with no contracts required. You can start and stop agreements anytime and we only charge for actual hours spent, so if the estimate is higher than actual hours required, we save you the difference. Scheduled maintenance is available for all machines we sell, and trip charges may be reduced or waived for enrolling 10 or more machines in the program. 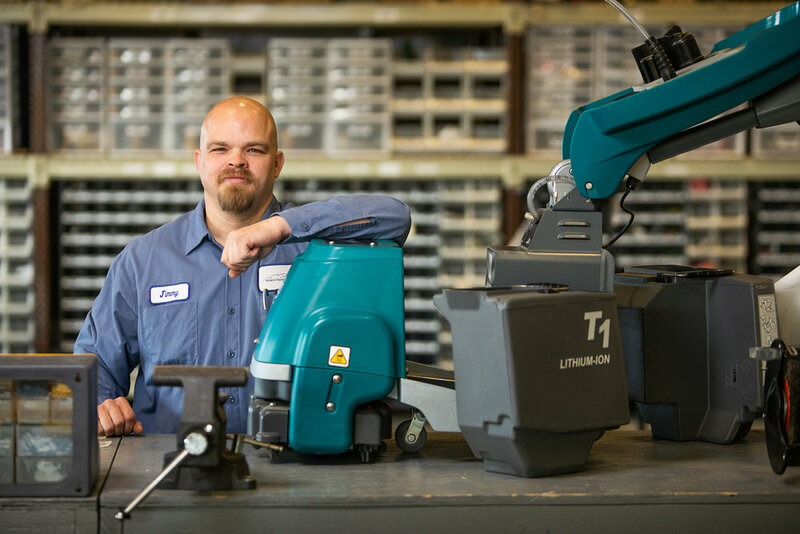 As new machines become available, we stock main parts to expedite repairs and maintenance turnaround times. Western Paper’s service department’s flexibility ensures we can customize a program that’s right for your needs, machines and budget. Many of our competitors don’t even offer paper, skincare and chemical management dispenser installation and service. We provide it free of charge! Western Paper’s mobile techs provide expert installations—recessed models included—to ensure your dispensers look and work great immediately. From BRIGHT SOLUTIONS to virtually all other major manufactures' products, we provide quality, onsite installation service to ensure your dispensers function properly and provide a positive user experience. Choosing and purchasing the right cleaning equipment can be an overwhelming challenge. Western Paper’s expert sales and service consultants can evaluate your specific facilities’ needs and budget to recommend the most strategic product purchase. We carry the industry’s top brands and models. We also stock main parts for the machines so that scheduled maintenance can be performed in a timely and efficient manner to keep you up and running. Western Paper can schedule hands-on demonstration and professional training for how to properly use and maintain your cleaning equipment. Our team can show you how to get the most of your equipment to ensure reliable results and equipment life longevity. Why pore over complicated user manuals or risk improper equipment usage when you can have personalized, knowledgeable support? We’re here to help. Western Paper’s mobile technicians can provide monthly reporting on load counts for your washers. In addition, they can restock supplies and perform maintenance on squeeze tubes and pumps to enhance efficiency and reduce unscheduled downtime. Our experts can also evaluate cleaning results of both white and colored loads and make necessary adjustments to maximize the cleaning potential of your washers. Western Paper recognizes that it’s vital to ensure health inspectors find favorable results when evaluating your warewash system’s performance. Your business depends on it. That’s why we deploy an expert mobile team of technicians to regularly test water temperature and hardness, evaluate dilution effectiveness and perform scheduled maintenance to promote healthy sanitation and consistent washing results. Find out how we can provide peace of mind with regular warewash service.